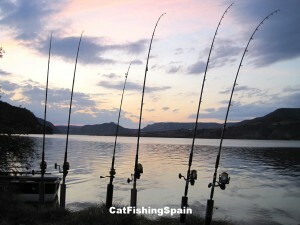 Book your holidays trip for catfish fishing at Mequinenza on the River Ebro, in Spain. 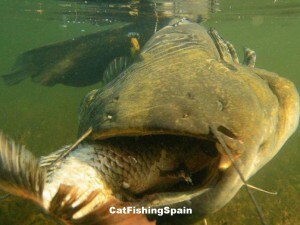 Nowadays, River Ebro and the reservoirs of Ribarroja and Mequinenza are known worldwide thanks to the catfish. 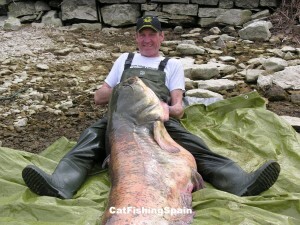 These places due to the quality, quantity, size and weight ratio are undoubtedly the top one destination for the passionate fishermen of this specie. 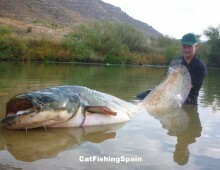 Its the best site for catfish fishing in Spain. 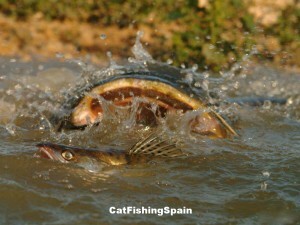 Catfish fishing on the river Ebro: We are ready to make a memorable fishing adventure!! 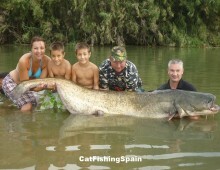 A guided trip on Spain's Ebro River System, often means exploring the river on one of our powerful guide boats. 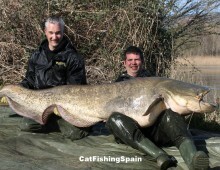 It is quite an exciting experience and we find that our customers enjoy this activity, perhaps more so than just sitting on the river bank waiting for a catch, with a row of other fellow anglers. 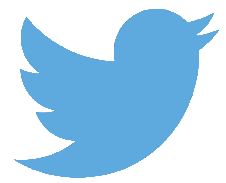 Also it delivers the goods, because if one spot isn't productive, we keep working for you until we find one that is. 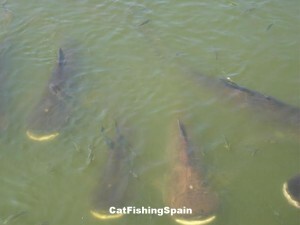 Our guests visit from all over Europe to enjoy the area´s fantastic catfish fishing and many of them return every season. 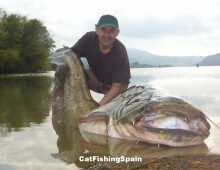 The camp is run by our highly experienced and knowledgeable team of angling guides, which helps to make your fishing trip run smoothly. You will find all of our staff passionate about fishing and willing to provide tuition and advice if required for all species of fish. 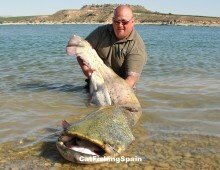 The Ebro is most famous for its huge stock of massive catfish. 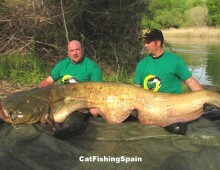 Tempting, hooking and landing a "ton" is one of the ultimate challenges for anglers in Europe today. 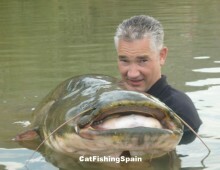 If you've never experienced the raw power of a cat before, you'll be amazed at how hard these fish can fight. 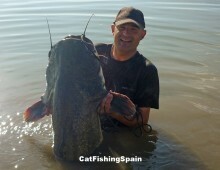 The Ebro´s fantastic catfish fishing attracts our guests from all over Europe and many of them return every season. 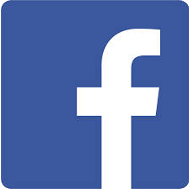 We pride ourselves on the quality and range of accommodation that we can offer our guests. 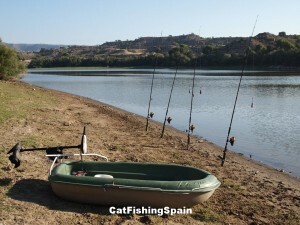 This ranges from the famous fishing camp, the first of its kind in Mequinenza, to beautiful air conditioned apartments in Mequinenza. Our range of accommodation is truly second to none in the area. 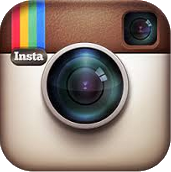 We make no apologies when we say our accommodation is the best in the Ebro region! 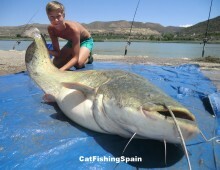 Every catfish angler who books a trip with us can have their Spanish fishing licences ready and waiting for them on arrival. Simply order them when you book your stay. 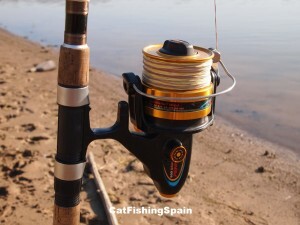 Although you may prefer to use your own equipment, we have available on site the finest Shimano equipment. 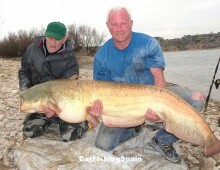 The results for catfish during the years have been going from strength to strength on the Ebro. 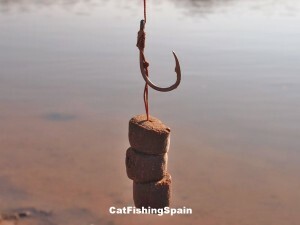 Pellet fishing is still the preferred choice for most anglers and the average sizes are increasing annually. More and more fish are coming out over the hundred and fifty pound mark and our guides have helped our customers catch fish of up to 265 lbs (120 kgs)! 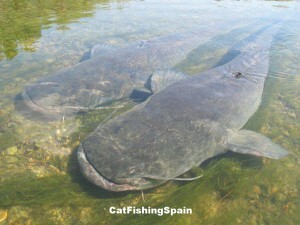 Often these huge fish are caught within a few hundred meters of our camp which is right on the bank of the river. 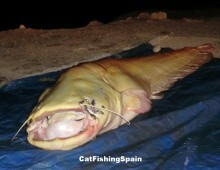 If you are really lucky, you have a chance to catch one of the beautiful and rare albino catfish that swim in this part of the river.